Is Vaping Actually Better for You Than Smoking? It’s harmless water vapor, they say. Vape juices taste like cotton candy and glazed donuts, they say. People will mistake you for a badass, partying Stephen Dorff, they say. There's even a US congressman who claimed vaping is "the future," just after hitting a vape pen during a hearing. 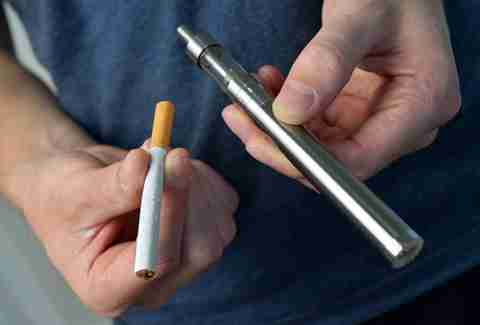 Since e-cigs deliver nicotine via water vapor rather than burning tobacco, it’s easy to get on board with the logic that it must be healthier than smoking cigarettes. But is it actually true? Dr. Neil Schachter, professor of medicine at the Mount Sinai Icahn School of Medicine and member of the American Lung Association’s American Northeast board of directors, Dr. Homayoon Sanati, medical oncologist at MemorialCare Cancer Institute at Orange Coast Memorial Medical Center, and Dr. Scott Weiss, co-founder and clinical director of Bodhizone Physical Therapy and Wellness, have the scoop. So You’ve Stopped Smoking. How Long Until Your Lungs Get Better? You had a feeling that’s what the doctors were going to say, didn't you? Well, you're right. Doctors hate vaping. 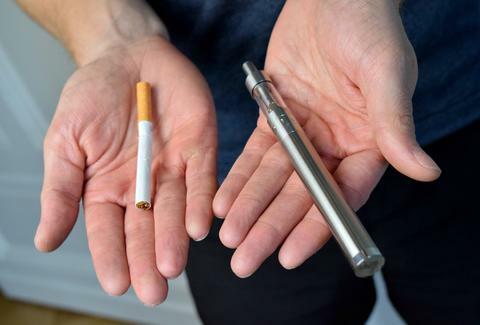 "[E-cigarettes] are a potentially dangerous product, and at the very least should be regulated if not put on a temporary ban until we figure out whether it serves any useful purpose other than making money," Dr. Schachter says. Whoa. Them's fightin' words. Hold on to your box mods, because it gets worse. E-cigs carry unique risks not found in cigarettes, mainly from ingredients in the "juice" flavorings: formaldehyde, acetylpropionyl, acetoin, and diacetyl, all of which are carcinogens or irritants. E-cigarette aerosol also can contain traces of metals like tin, silver, iron, copper, nickel, and aluminum, Dr. Weiss says. "While some may claim that these traces are small, it doesn't take very much to reach toxic levels," he adds. And while manufacturers point out that ingredients like glycerin or propylene glycol are generally recognized as safe by the FDA, that designation only applies when the ingredients are eaten -- not when they’re inhaled. Don’t forget that vaping does all the same terrible stuff to your body that smoking does (minus the tar): it increases your blood pressure, heart rate, breathing rate, white blood cell count, plus it can enhance systemic inflammation and alter your metabolic rate, Dr. Weiss says. And of course, good old nicotine causes coronary artery diseases and increases the risk of stroke, Dr. Sanati points out. OK, vaping's bad. But it can't be worse than a pack-a-day habit, can it? The jury's still out on that one. Vaping is a relatively new phenomenon, and it can take decades to prove that something's actually bad for you. First, you have to do epidemiological studies to prove that people who are vaping have more problems than people who don’t vape; then you have to figure out which ingredients might be responsible; then you have to show cause and effect. That's a long process! Case in point: cigarettes have been around since at least the 16th or 17th century. But as recently as the 1950s and '60s, there was debate about whether smoking was good or bad for you. "Go look at magazine ads from the 1950s," Dr. Schachter says. "Lots of advertisements had four out of five doctors saying [cigarettes] were useful for stomach ailments or various nervous conditions. People who should have known better were, up until the last minute, on the wrong side." So... vaping is at least as bad as smoking. And it may be much, much worse! "The danger can't be overstated," Dr. Schachter says. "Why take a chance and find out 30 to 40 years from now that we've done a horrible thing?" Actually, there's an easy answer to that: because vaping's addictive. So how am I supposed to quit this cigarette habit? Not by vaping. Dr. Schachter says that’s "probably one of the worst ways you could cut out cigarettes." Unlike other smoking cessation methods, like nicotine patches, lozenges and gums, or medications like CHANTIX and Wellbutrin, vaping is completely unregulated. "Most people who quit, quit on their own," Dr. Schachter says. "Eighty to 90% do it by willpower, and what doctors can do is guide people toward how to approach that quitting strategy." And if you relapse, try, try again. "Trying again increases the chance of success," Dr. Schachter says. In fact, if you consider the e-cigarette industry’s marketing efforts geared toward teenagers and young adults (which include candy-flavored products and celebrity endorsements, the Centers for Disease Control reports), it might just be another evil. "[E-cigarette companies] are marketing vaping as a safe thing, and targeting a lot of young teenagers, who would then become lifetime users," Dr. Sanati says. "It’s very similar to almost 80 years ago, when smoking was considered safe." "My feeling is, we have the example of cigarettes," Dr. Schachter concurs. "And these e-cigarettes don’t fall far from the tree." Missy Wilkinson is done with social smoking. Follow her tweets at @missy_wilkinson.